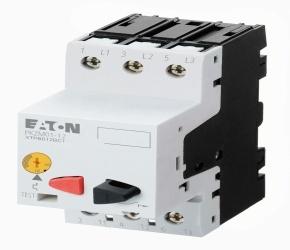 The entire range from 0.1 A to 63 A is covered by two motor-protective circuit-breakers. With just 18 different types, this saves storage space and simplifies engineering. he proven PKZM0 switches motors from 0.16 to 32 A. The short-circuit breaking capacity is now rated to 150 kA up to 12 A and 50 kA up to 32 A. The PKZM 4 also has a breaking capacity up to 50 kA. With this, current limiters become almost unnecessary. These motor-protective circuit-breakers are matched to the DIL contactor series, which is ideal for the configuration of motor-starter combinations. Regardless of whether it is an integrated auxiliary contact, trip-indicating auxiliary contact, voltage release or door coupling rotary handle, the accessories can be used for both the PKZM0 and the PKZM4. - Common engineering basis for different applications and export countries.